Two months after returning home we are still impressed by that beautiful 1 week adventure. It takes a while to fully "absorb" such a unique experience, especially when the return back to 'real life' and work is so intensive.. We are proudly looking thru our photos and can't help thinking – where and when is the next adventure and mostly - would it be as good as this?? We hope your trip to Mongolia was beyond your expectations too. We wanted to thank you very much for making that week unforgettable, no doubt thanks to the beautiful sceneries and nature but definitely thanks to your professionalism and friendship too. It was a lifetime experience which was the highlight of the whole month of travel. 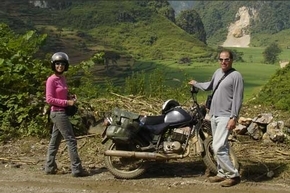 This is probably how a traveler who would have only a week to spare in Vietnam, ought to travel, BUT, if they are lucky enough to have more time in this pretty country they better plan it right by keeping this adventure – as the diamond - for the end. We've attached a few photos for your pleasure..
Take care and hope to hear/see/ride with u again.